Today's post is so bittersweet for me. It has been coming for a while now, but I didn't really want to face it. You see, for very personal reasons, this site is so important to me. I am visually impaired and this online community of creatives has filled a social void for me, and many others that have their own reasons to join this wonderful community. Some crafters have reported not having any “real life” friends that enjoy this particular hobby, others live too remotely to attend crops and some have issues similar to mine which means they too spend a lot of time at home alone. Of course, many just love the online aspect in addition to “in person” events. That said, it is necessary that I close down Stuck?! Sketches, as I must switch gears and reduce my scrapbooking to only occasionally and halt the other duties that go along with running my site. I would like to take this opportunity to thank the many people that have touched my heart and inspired me greatly over the years. Stuck?! Sketches has always had the most wonderful design teams and the current one is particularly lovely in their support of me and each other. They work hard to meet their deadlines, and comment on our many, many entries each month. Some even create process videos, too! Trust me I know how long all of these tasks take. And I truly appreciate each of our team members. Janice in particular, needs a special thank you for being a great help and friend to me, I couldn't have run Stuck?! Sketches without her help all these years! I would like to thank each of you, our treasured followers, for playing along with us month after month, we wish we could give you all prizes! Thank you for sharing your creations and bits of your lives with us! And speaking of prizes, the generous support of our sponsors has truly meant the world to me. 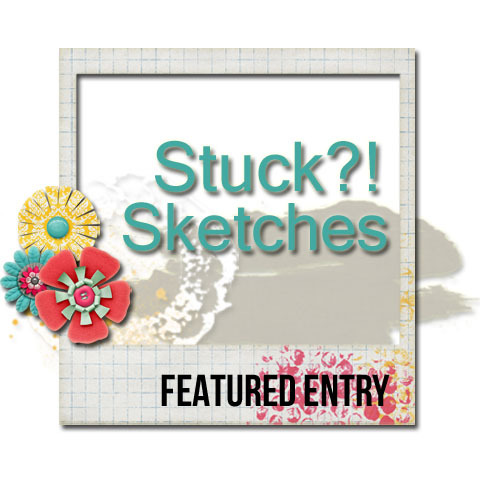 It has allowed me to do what I love; sharing sketches and layouts with the scrapbooking community; amassing talented design teams to inspire and cheer on our followers; and give away more prizes than I can count! You can view our sponsor page, for a list of our most recent and super generous sponsors. Finally, I would be remiss if I didn't thank my husband, Ian, for his help and support of this site and my passion for this hobby. 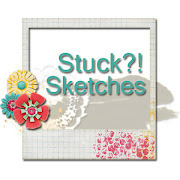 As a thank you to all of you, a sketchbook of all of my sketches for Stuck?! Sketches has been created, you can download a free pdf version here. Please feel free to let me know if you have any questions. And again, thank you from the bottom of my heart for your support. I am popping back in for one final share and to say a huge thank you for all of the sweet comments that have been left here! I thought some of you may be looking for sources of new sketch inspiration so I thought I would give a shout out to some of the lovely companies that have sponsored us recently! 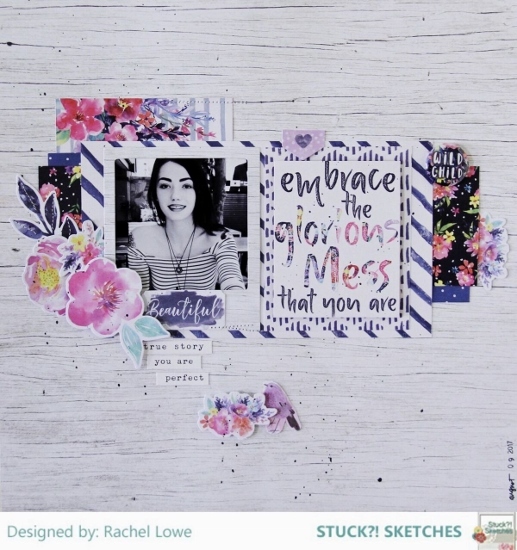 My Creative Scrapbook Kit Club, offers monthly sketch challenges, and you do not need to be a member of the club to play along. You can find the monthly sketches here, on their blog, they are usually revealed on the 15th. And for a bit of fun info. the sketches throughout 2018 have been created by yours truly! 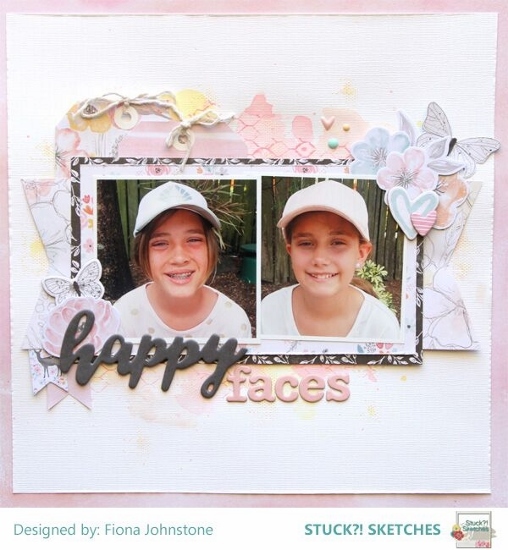 The Scraproom Kit Club offers monthly sketch challenges, on their blog, you do not need to be a member to play. Find a link to each current sketch in their side bar. 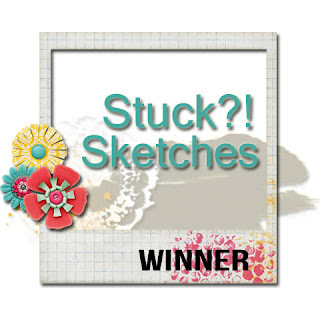 Cocoa Daisy Kit Club also offers a monthly sketch challenge, you can find the reveals here. Paper Issues, offers many challenges each month, and one is usually a sketch. You can find all of the current challenge here, on their Facebook group. I encourage you to pop over to each site, to check out their challenges and be sure to rad up on the rules, time lines, etc. for each one! We are feeling super thankful for how many incredible layouts were entered into our link ups this month! As always we have used Random.org to choose our winners. So let's give away some prizes, we are drawing for 5 winners today! 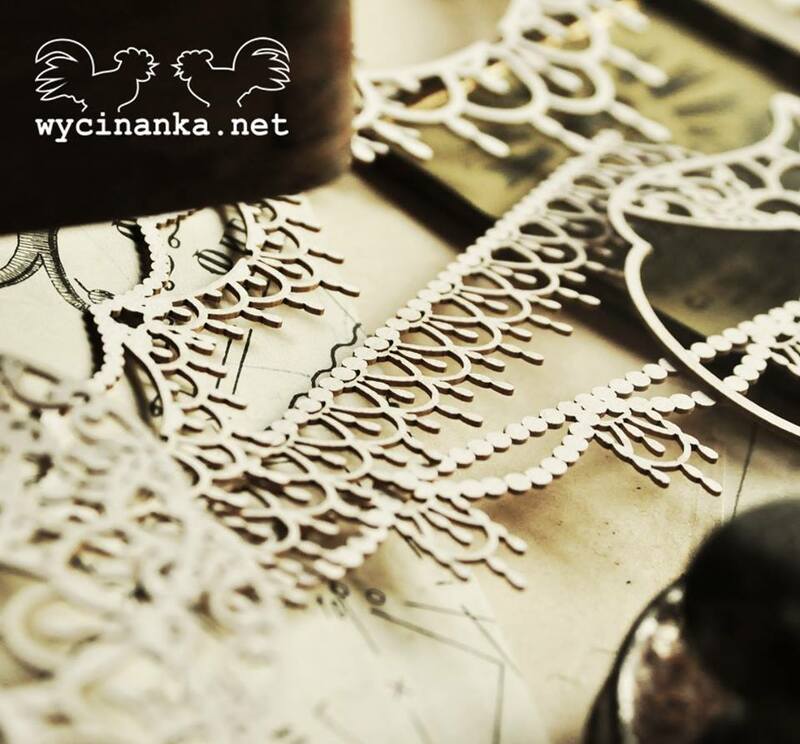 Our first sponsor was Wycinanka, who is offering our first winner a beautiful themed chipboard prize pack. Our randomly drawn winner is 51. Kicka! 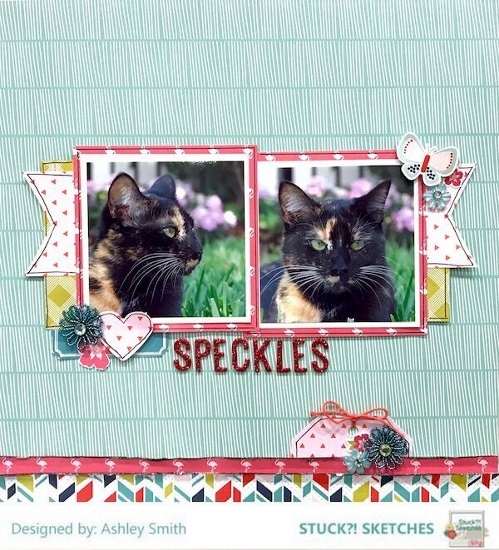 Our second sponsor was SpiegelMom Scraps, who is offering our second winner some of their newl revealed sequin mixes. Our randomly drawn winner is 54. I Love You! Our third sponsor was Paper Issues, who is offering our second winner a $20.00 gift certificate to their online store. Our randomly drawn winner is 45. Create and Share! Our first sponsor was Creative Embellishments, who is offering our first winner a $25.00 gift certificate to their online store. Our randomly drawn winner is 22. Sandi Pressley! Our second sponsor was Scrapbook Nerd, who is offering our second winner a $20.00 gift certificate to their online store. Our randomly drawn winner is 28. 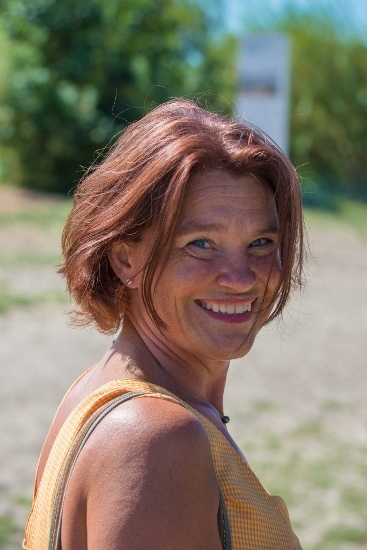 Simply Bliss – Brande! Congratulations to all of our winners! Grab your winner badge and display it proudly on your blog! Please contact me at laurawhitaker50@gmail.com , put STUCK?! WINNER in the subject line, to claim your prize. You have 7 days to claim your prize or it will be forfeited. Hello, and thanks for joining us for our fourth featured layout of March. Before we show you this inspirational page that was submitted to our March 15th sketch challenge, we want to recognize our fabulous sponsors. A big thank you goes out to Creative Embellishments for sponsoring this challenge with a $25.00 gift certificate to their online shop for one lucky participant! 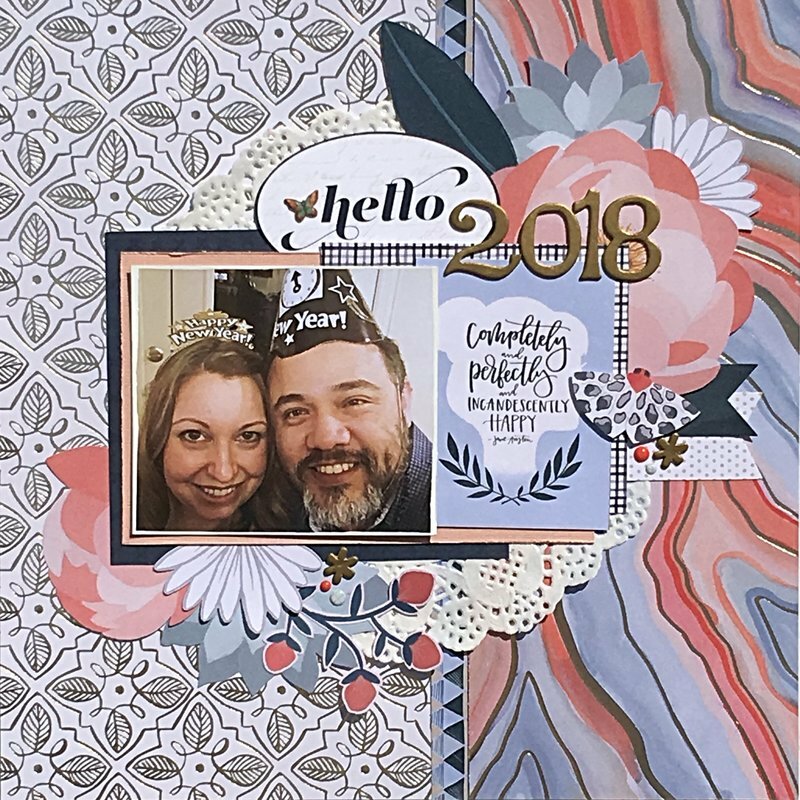 Creative Embellishments is a new family owned company that was created by Michael and Nicolle Kramer. We are a husband and wife team who design and manufacture unique, high quality chipboard, wood and rubber stamp products. It is our mission is to offer fun and inspiring products to bring out your inner creativity that you can add to any project. In the near future we will be expanding into other mediums such as rubber/acrylic stamps and acrylic embellishments. 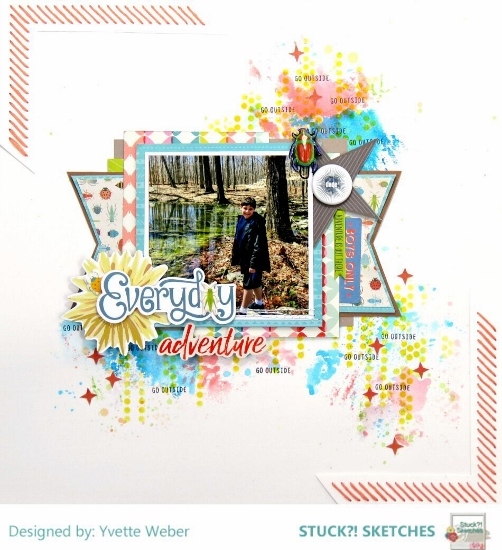 AND thank you to Scrapbook Nerd, who is also sponsoring this challenge—offering a $20.00 gift certificate to their online shop for a second lucky participant. 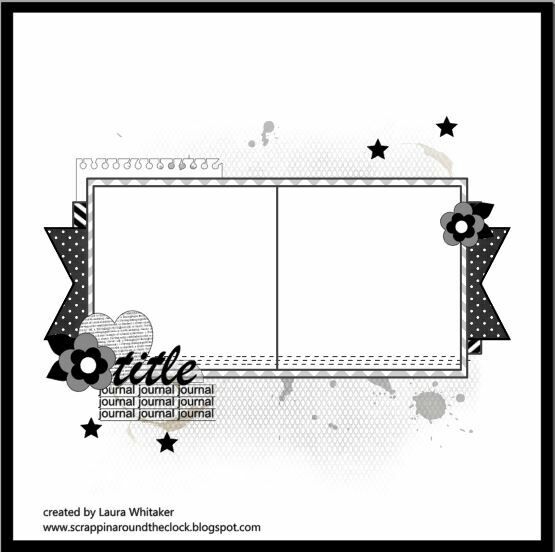 Scrapbook Nerd is committed to helping you find creative ways to capture and preserve your memories. 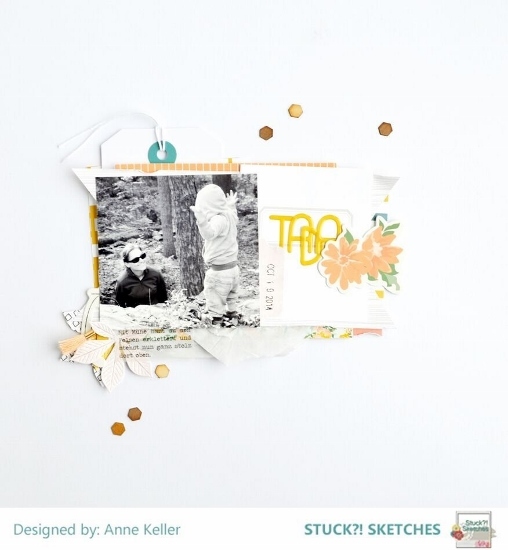 We have a passion for scrapbooking and other paper crafts and we want to share that with you. Its our goal to provide you with quality products from companies you know and introduce you to ones you might not. As part of our commitment to you Scrapbook Nerd has a forum & gallery. A friendly place you can connect with other crafters, share ideas and techniques that will help grow your crafty skills. Sign up for our newsletter to see all the latest happenings here at Scrapbook Nerd. Here is our stunning featured layout. Although the creator didn't include her name on the page, we wanted to share it just the same. Look at all that gorgeous color, texture, pattern, and detail. It feels just like being at the aquarium! We are so glad you joined us for this challenge. Please grab our "featured" button below and wear it on your blog. Please link up your layouts over in the sidebar by March 29th at midnight EST to be in the running for one of our prizes. All prizes will be drawn randomly using Random.org to pick a number. Thank you for visiting us today. We hope our sketch inspires you. Be sure to show us what you've made because we love to see your work and hand out prizes. 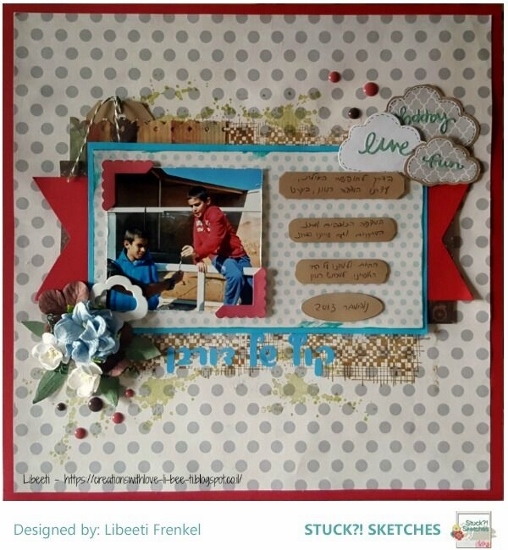 Hello, and thanks for joining us for our third featured layout of March. Before we show you this inspirational page that was submitted to our March 15th sketch challenge, we want to recognize our fabulous sponsors. Esther is our featured artist today. This photo is darling. And it goes so nicely with the soft and pretty pink, aqua, and yellow color scheme. The frame provided by the texture paste and watercolor flowers finish the look perfectly. We are so glad you joined us, Esther. Please grab our "featured" button below and wear it on your blog. Hello there and welcome back. Today we are launching our mid month challenge and we are looking forward to seeing how you interpret it! A big thank you goes out to Creative Embellishments, for sponsoring this challenge, they are offering a $25.00 gift certificate to their online shop to one lucky participant! 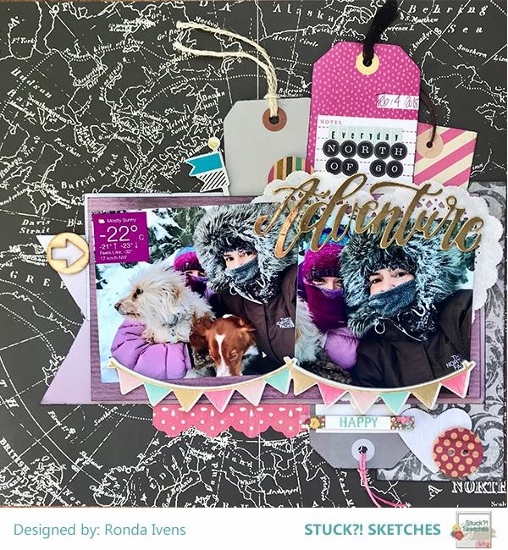 AND thank you to Scrapbook Nerd, who are also sponsoring this challenge, offering a $20.00 gift certificate to their online shop to a second lucky participant! As always we have a guest designer joining us. Please help us welcome Caroline to our challenge!! "My name is Caroline and I live in Sweden, mother to three great kids and a wife to my best friend. 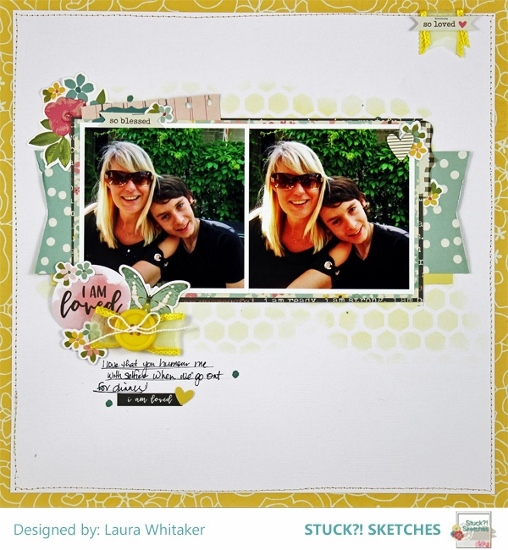 I started to do scrapbooking when we adopted our son from South Africa. I was going to do an album about our trip. It is 14 years ago! So I continued to scrap all kinds of moments in our lives. 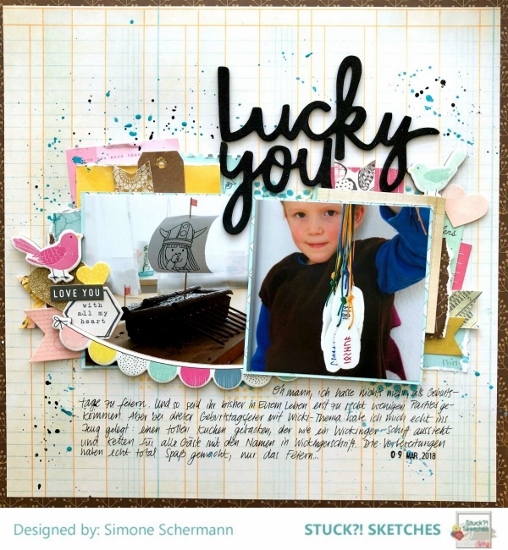 I have worked as a designer for a Swedish shop and a Swedish scrapbooking Magazine. 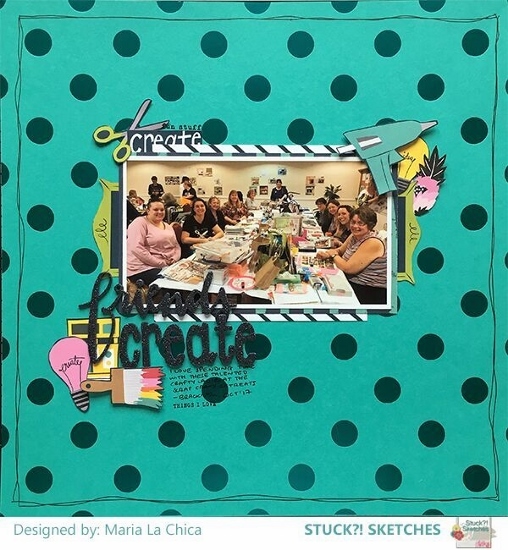 I have been teaching at scrapbooking events. I just love to create alone or with friends!" Here is Caroline's amazing layout based on our sketch. Thank you for joining us Caroline! Please link up your layouts over in the sidebar by March 29th at Midnight EST to be in the running for one of our prizes! All prizes will be drawn randomly using Random.org to pick a number. Thank you for visiting, we cannot wait to see what you create! Hello, and thanks for joining us for our second featured layout of March. Before we show you this inspirational page that was submitted to our March 1st sketch challenge, we want to recognize our three fabulous sponsors. A big thank you goes out to Wycinanka, for sponsoring this challenge with a beautiful themed chipboard prize pack for one lucky participant! AND thank you to SpiegelMom Scraps, who is sponsoring this challenge with three of the newly revealed sequin mixes for the month for a second lucky participant! Hi everyone! I'm Jody Spiegelhoff, the proud owner of SpiegelMom Scrap (SMS). I live in Wisconsin, USA with my busy and crazy blended family. I’ve been crafting since childhood, and began stamping and scrapbooking in 2002. Creating has always been my quiet time and firmly believe that taking a little time each day to be creative is so important and good for our souls. I started SMS officially in 2010 and have loved growing my business ever since. 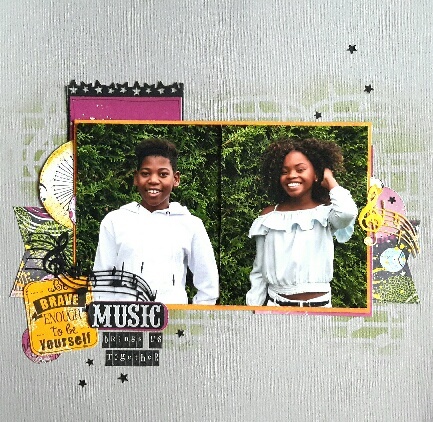 I totally love creating unique sequin mixes which are inspired by a variety of things around me; nature, new scrapbook collections, artwork, my daughters and more. You can find SMS on Instagram @Spiegelmom_Scraps, on Facebook, YouTube and the website www.spiegelmomscraps.com. We'd love for you to stop by and check us out! The Sparklers Design Team and I love to read your sweet comments. We would also like to thank Paper Issues for being our third sponsor for this challenge and offering a $20.00 gift certificate to their online shop. Be sure to watch for our post next week as we will be featuring gorgeous creations by some of the Paper Issues DT using his sketch! 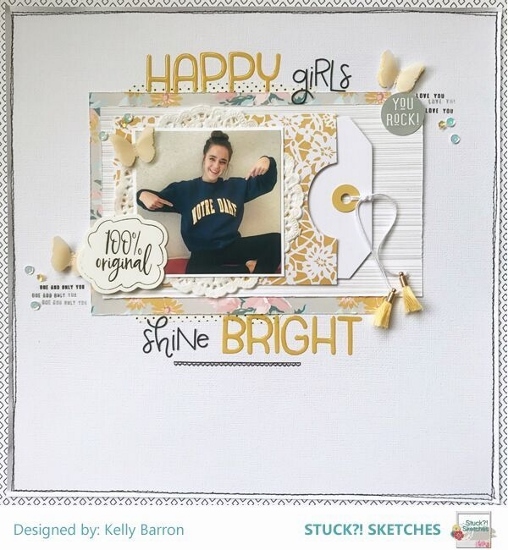 Paper Issues is an online scrapbooking store that carries all of the major brands along with hundreds of FREE Cut Files. Paper Issues has an amazing online community with monthly challenges and give aways. You can use the code STUCK to save 20% off in the Paper Issues shop all month long. https://www.facebook.com/groups/1499810043590964/ - Our Facebook Group. Be sure to join the Paper Issues Facebook Group, where our March 1st sketch will be offered as a challenge. You can link up there for a chance to win another prize from Paper Issues!! CAgirl327 is our featured artist today. I love the way the patterns on the two halves are so different but pull together so nicely to provide a backdrop for the centerpiece. And the flower die cuts and doily create a swirl of color and texture around the layered photo frame. We are so glad you joined us, CAgirl327. Please grab our "featured" button below and wear it on your blog. Hello, and thanks for joining us for our first featured layout of March. 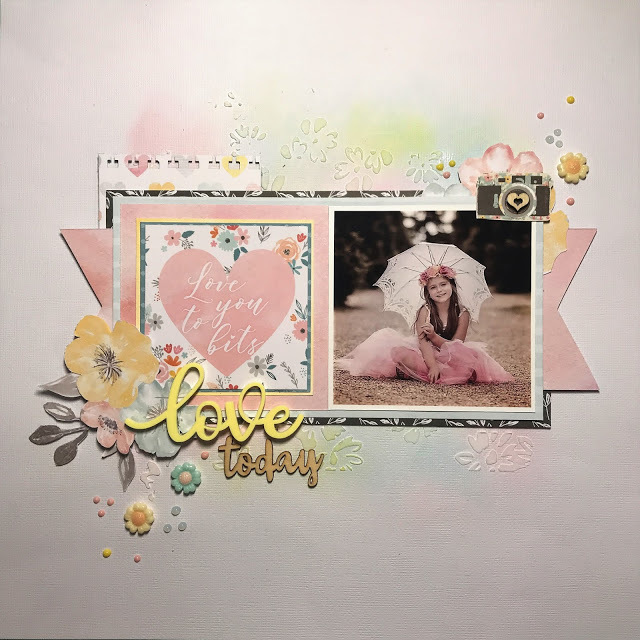 Before we show you this inspirational page that was submitted to our February 15th sketch challenge, we want to recognize our three fabulous sponsors. 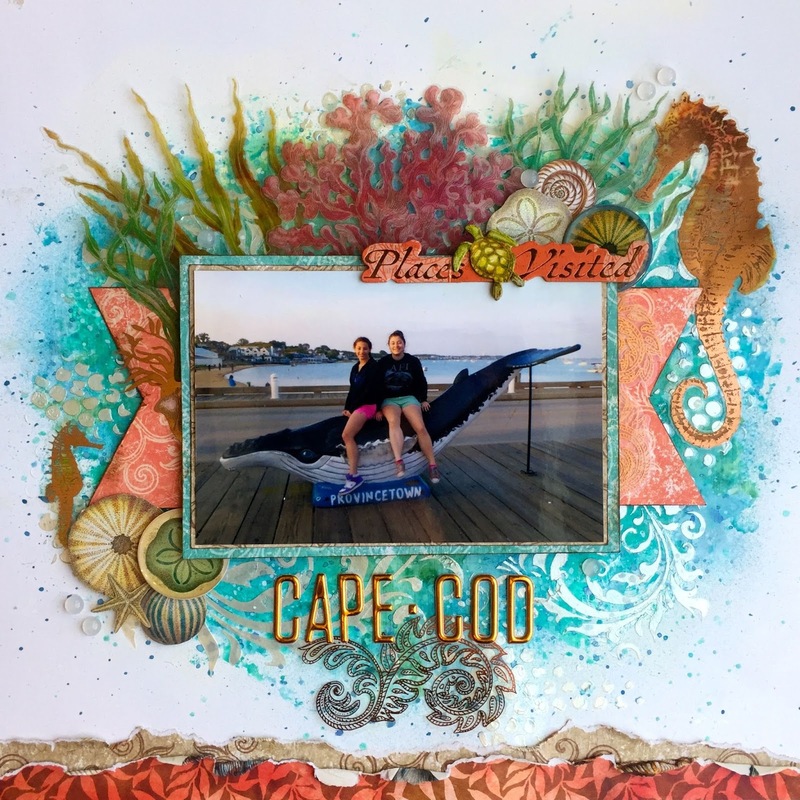 Scrapstorian is our featured artist today. Flipping the elements and creating a sports page is such a great way to use the features of our March 1st sketch. The circles, stars, and decorative brads mimic the motion in a women's soccer game so well and pull the eye straight into the photos. We are so glad you joined us, Scrapstorian. Please grab our "featured" button below and wear it on your blog.